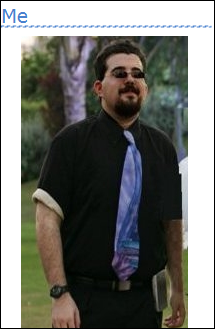 Welcome to my new Silverlight Weblog! Join me on a tour of the numerous features this blogging engine offers. 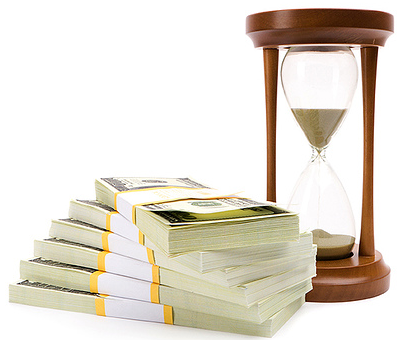 Simply put: my time is worth money. I blog as a labour of love, devotion and personal passion. As such, I’d like to spend the minimum amount of time required to setup a blog. For me, it was an easy choice. Now I get to experiment with which UI patterns work best for blogging. Not just use the same handy down comprise-driven-UI I’ve always had. Using accordions for the front page, expanding panels for comments, responsive user interface, and many others are just some of the benefits Silverlight afforded this blog. Silverlight - User Interface front end. WCF RIA Services - Server<->Client Communication. PRISM – Commanding and Messaging support. Managed Extensibility Framework (MEF) – Dynamically loading blog widgets. ASP.Net Webforms & ASP.Net MVC – Processing client requests and returning shell HTML. ASP.Net Dynamic Data (AJAX, Webforms) – The back office management portal. WCF Syndication Services – RSS 2.0 and Atom 1.0 Feeds. SQL Server 2008 – Database. Entity Framework V3.5 – Data Access Layer. MSTest - Unit testing Server side. Microsoft Silverlight Unit Testing Framework – Unit testing Client side. RhinoMocks – Unit testing Mocking. Unity – IoC Unit Testing framework. 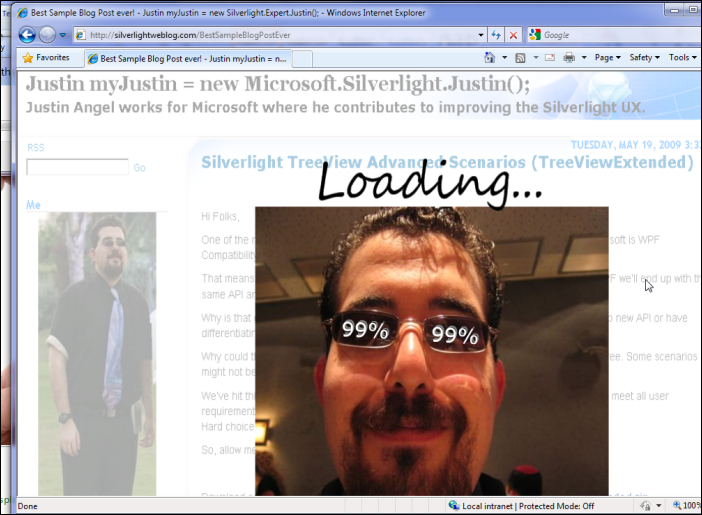 3rd Party commercial component – rendering out HTML in Silverlight. Everything else – home grown. 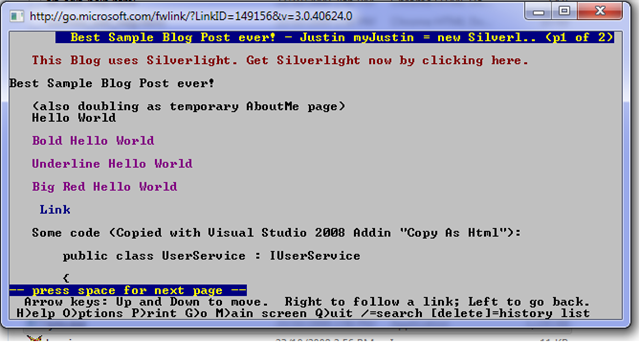 Is Silverlight Weblog open source? Yes. Get it @ http://SilverlightWeblog.codeplex.com under Ms-PL license. A major part of my workflow when authoring blog posts is using Windows Live Writer. 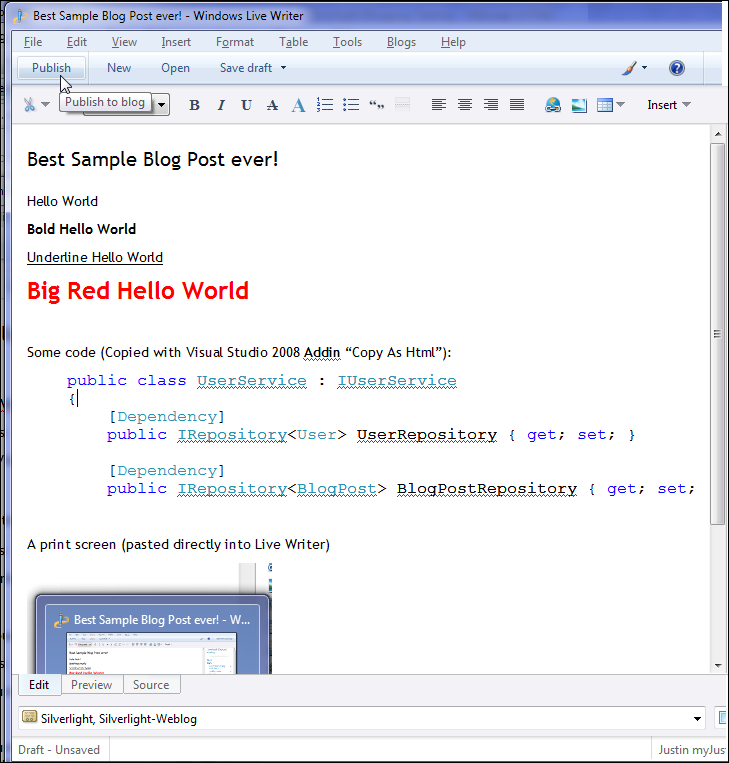 Support for Windows Live Writer is enabled through the Metaweblog API. When posting from Windows Live Writer the blog post author can tag blog posts. 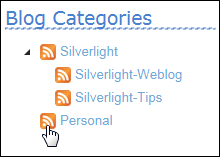 The Silverlight Weblog blogging engine support endlessly nested hierarchical categories. The Print screen above shows 3 levels of Categories, but in theory the blog supports infinite nesting. Clicking on a Category Link in the Categories Tree or In a Blog post would navigate the user to a list of all blog posts in that category. Silverlight Weblog supports leaving infinitely nested comments on blog posts. Having properly nested comments elevates the mess of replying to 6 people in one comment. 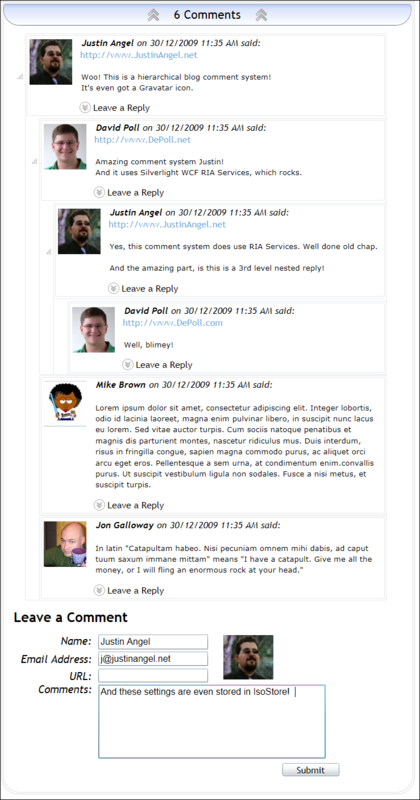 As you can see from the above print screen each comment is accompanied with a Gravatar and can be infinitely nested to a parent. 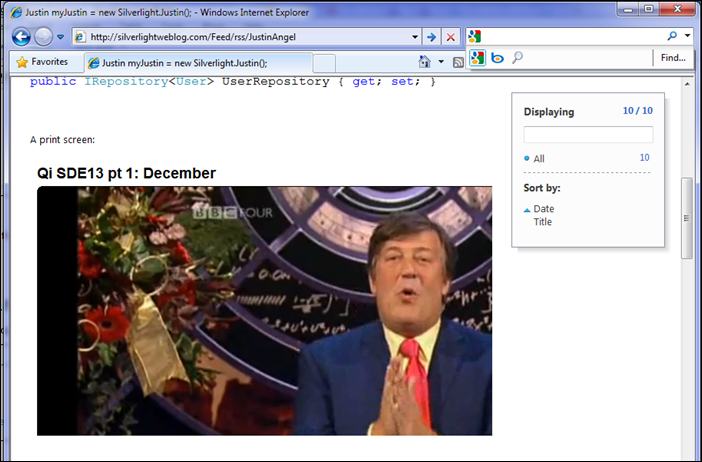 Silverlight Weblog supports RSS and Atom feed formats through the Links Widget. Clicking the RSS Icon next to each category would provide the user with a link to it’s RSS link. 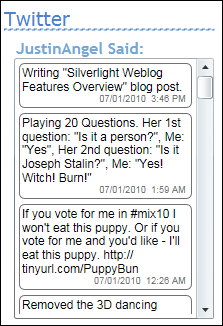 Silverlight Weblog displays the latest non-reply tweets from the blog author on the Sidebar. When mouseovering the Twitter widget it smoothly expands it’s vertical height to accoemdate easier reading. Clicking the “Twitter this blog post” link would open up a new tweet on twitter.com. 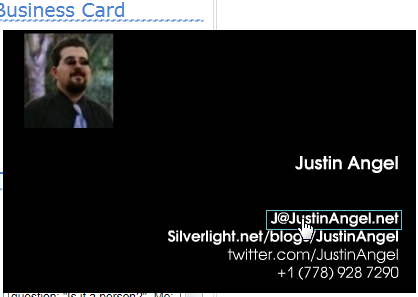 Silverlight Weblog generates easy to remember user-friendly URLs. This enables people to easily link to your Rich Internet Application and have it load up the relevant blog post. When hosting blogs, some blogs are meant for only one user while others are used by multiple users. Silverlight Weblog supports both schemes with it’s easy to customize UI and user-relevant URLs. In the print screens above it’s easy to see how the blog supports multiple users through a convenient URL schema. When authoring blog posts It’s always helpful to introduce richer content. Macros translate text into visual elements. Silverlight weblog is fully indexable by Google, Bing and Yahoo. 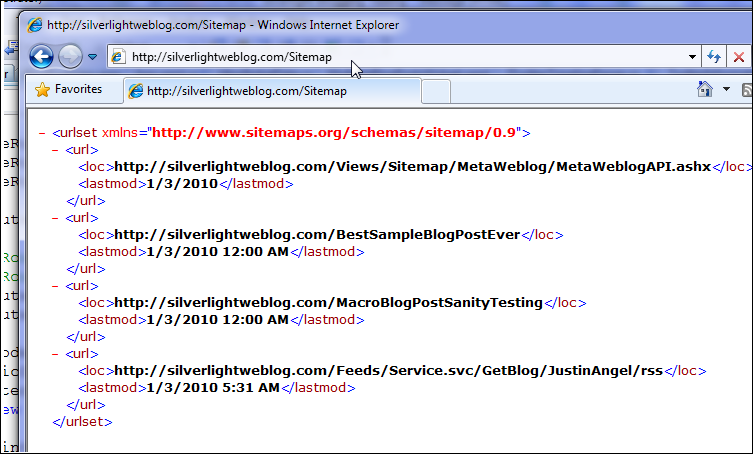 Each Silverlight weblog has a Robots.txt and a Site Map which lets the search engine know of the available blog posts. Each blog post page emits the proper HTML as to be indexed by google and accessible to disabled users. If you’re interested in this SEO technique you can read more about it at Brad Abrams’ blog post. When navigating in Silverlight Weblog the URL Anchor fragment changes accordingly. Which enables Silverlight Weblog to support Refresh, Back and Forward uses. 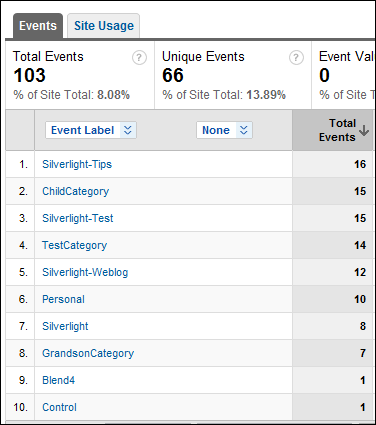 Every user action performed in Silverlight Weblog can be logged into Google Analytics. 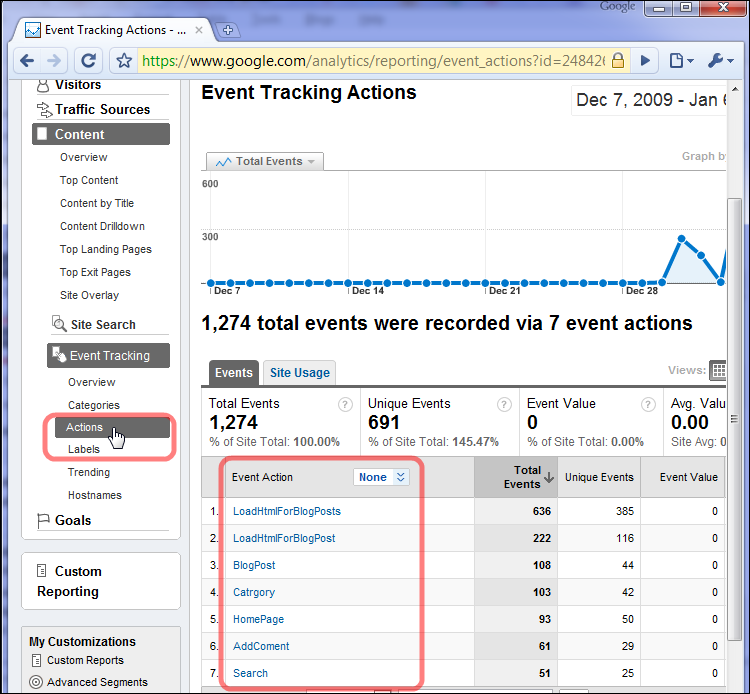 In the above print screen there’s a list of all User initiated actions (which did not cause a server postback) and have been logged in Google analytics. Primarily, Loading Blog Posts, Performing Searches, Leaving Comments, Viewing categories and other user initiated actions. 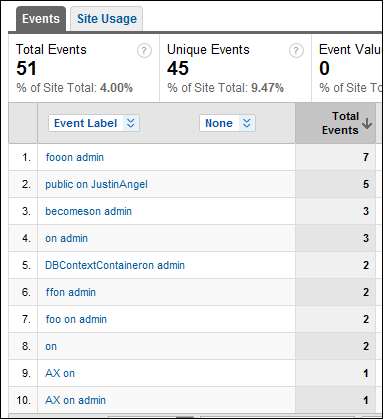 Silverlight weblog also supports drilling down into specific google analytics data. On the left there’s a list of search terms searched, and on the right a list of categories viewed. 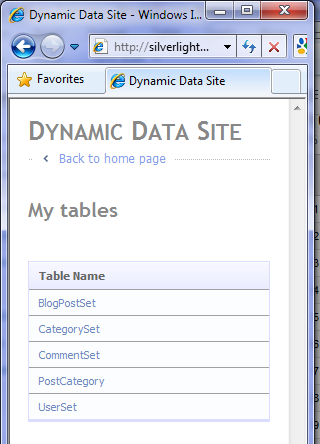 Using ASP.Net Dynamic Data an easy to use back office is generated for silverlight weblog. 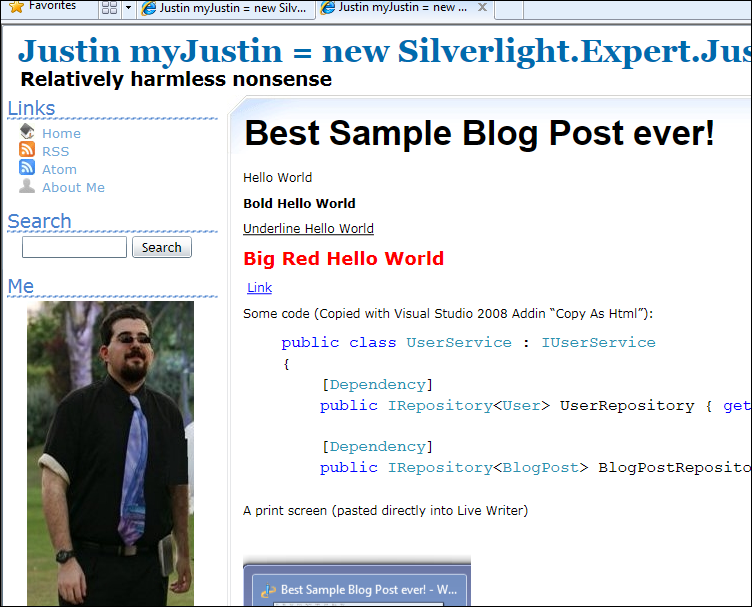 Silverlight Weblog is fully extensible. Each piece of the UI is considered a Widget and each response is an independent Service. 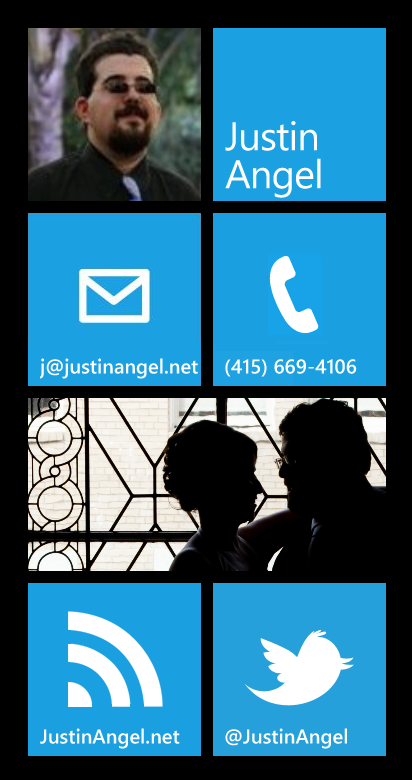 Widgets and Services communicate through Messages. Both of which are loaded dynamically by MEF which ends up composing the UI. Implementing custom Widgets and changing the default layout and behaviour is much easier than it appears to be. 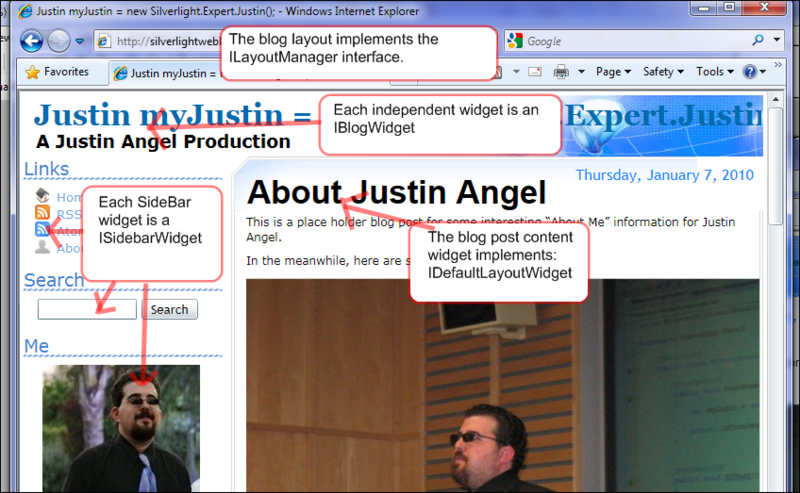 Through the Extensibility mechanism in Silverlight Weblog I easily implemented two of my favourite widgets. When first approaching a Silverlight Weblog, users will get an easy to understand “Get Silverlight” screen. Silverlight Weblog supports changing the default loading splash screen into a more relevant user exprience. In my case I wanted to let people know they were going into my blog. 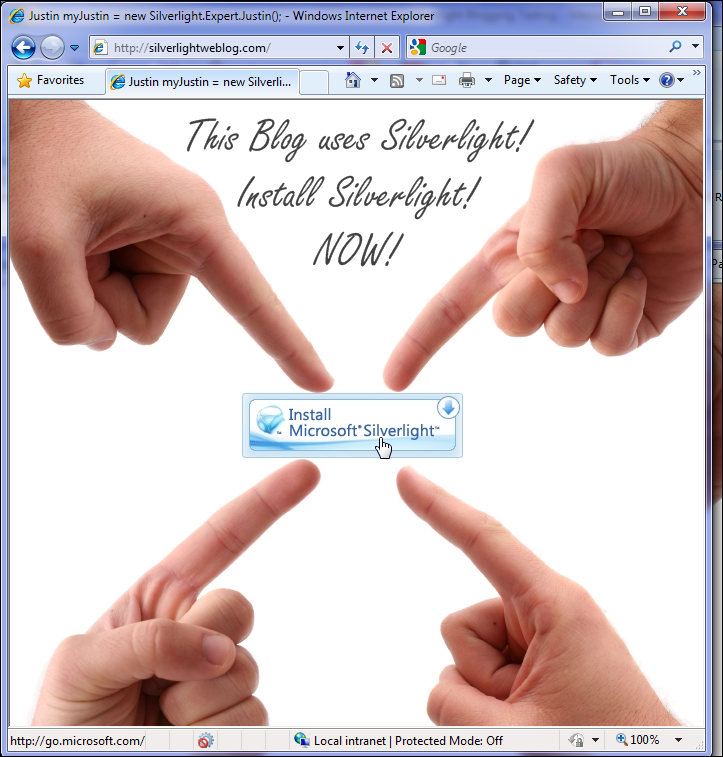 There are many other features included in Silverlight Weblog. Hopefully this first Silverlight weblog blog post was enough to give you a quick overview of this project. Scott Hanselman, Rob Eisenberg, Velvárt András, Yasser Makram, Rui Marinho, Ian Smith, Juan Puebla, Mark Woodhall and Jim Wightman. Feel free to leave a comment and let me know your thoughts! Published on 1/7/2010 12:00:00 AM by Justin Angel ©2019.